Mélanie Poirier is a trained biologist. 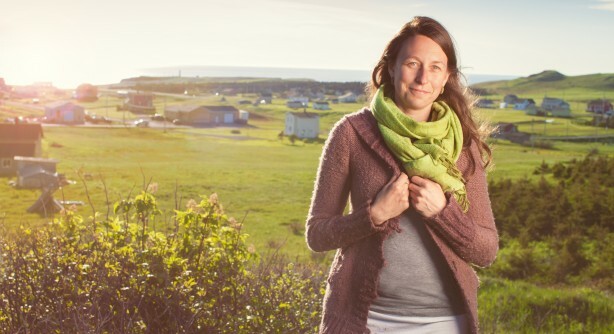 She works for Comité ZIP, an environmental collaborative organisation whose mandate is to support local initiatives for the protection, restoration, conservation and development of the territory of Îles de la Madeleine. Mélanie is a mild-mannered woman with a calm and measured disposition. She lives in harmony with the nature that surrounds her. On Les Îles, the eye meets no obstacle. The horizon has no limits and this is exactly what Mélanie finds so appealing. For her, the territory encompasses the sea and a limitless horizon. All in all, what a vast playground it is! Choosing to live on Les Îles is choosing proximity with nature. Like numerous young Madelinots, Mélanie left Les Îles to further her studies and then she extended her absence to travel a bit. For a while, Mélanie and her spouse, Bruno Savary, roamed the country roads of Québec on their bicycles, stopping at farms along the way to exchange labour for room and board. This is called wwoofing. After this travelling, the urge to stop and linger in one place brought them to Les Îles. What was meant to last a summer lasted much longer. One contract led to another and the couple eventually decided to settle down. "On Les Îles, it's different"
- Life, landscapes, people, everything is different on Les Îles. "Our feeling grew that the quality of life that exists here would be difficult to find anywhere else. For us, the proximity of the environment was essential." The playground and the field of studies are close at hand. Melanie really appreciates the fact that it is possible to transition from work obligations to outdoor leisure activities in the blink of an eye. She needs this, as she needs to play in the dirt and to watch her garden grow in harmony with the insects who live in it. Life fascinates her. As she so aptly says, on Les Îles, beauty is everywhere accessible for everybody. All you need to do is stop and pay attention, a simple thing you may forget to do if you are born here. Mélanie is a scout leader. She organises camping activities on the archipelago for her young troop members. This transports them into another world! After an excursion, one of her young protégés once said to her: "Wow, this is beautiful! I can't believe we actually live here!" This kind of comment is Mélanie's reward. Mélanie is focused on the protection of the natural habitat of Les Îles. The fact that the territory is small makes it an ideal place to study. While this may render the territory more vulnerable it also makes it possible to observe quickly the results on one's actions. Mélanie's interests go to projects that centre on the protection of fragile environments and coastal erosion. These have long been important preoccupations in some areas of Les Îles. Coastal erosion is caused by natural occurrences which have been growing more intense, but also by human activities which it has not yet been possible to change. "Such a fragile and small territory requires that we adapt our activities and attitudes to its realities. There is obviously a cost to living on islands, but it is our responsibility to deal with it in a responsible manner." If you're hitchhiking and Melanie picks you up, she will readily dispense information about waste management and sanding projects, the ecological features of a fragile territory and the innovative strategies employed to protect it. The Comité ZIP, for example, has designated foot paths that run cross dunes to reach the water's edge. This important initiative prevents further deterioration of a natural feature of Les Îles. It makes the dunes healthier and better able to withstand assaults from the wind or the sea. By promoting a more responsible use of these spaces, the committee and its partners have contributed to the restoration and rehabilitation of areas that are important for the preservation of our resources and for the protection of the activities inherent to a coastal and marine environment.